Everyone loves skiing…or do they? The truth is that while many find love in zooming down the mountain by skis or board, for some it just isn’t their cup of tea. Parents with very young children, may also feel left out when their older ones and spouse want to hit the slopes while leaving them behind. The truth is that while not everyone loves skiing, there is no reason everyone can’t love ski areas when you know where to go and what to do! We’re here to provide some great ideas for special places, in this case ranging from the Eastern part of the United States and Canada, that have as much to offer off the slopes as on. Take our advice and choose your destination wisely, so those who don’t ski will have as much fun as those who do. Now there’s a happy family! Lake Placid, New York: The beautiful Adirondack Mountains are even better appreciated if you’re not moving at 40 miles an hour. Take your time to relax here where the stunning Whiteface Lodge where, even if you aren’t a guest, you can enjoy great food, warm drinks, an outdoor fireplace, spa treatments, movies or even bowling. If you want to be a little more active and enjoy winter sports of a different sort, check out the former Lake Placid Olympic Venue (now a museum and sports complex) where, among other things, you can take a stab at biathlon or bobsledding with an instructor. Be sure to check out our great Lake Placid itins for more family friendly ideas. 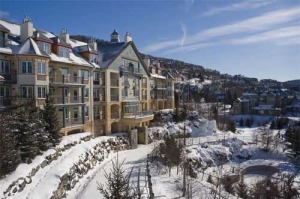 Mont Tremblant, Quebec: This gorgeous Canadian peak offers a lot to those who prefer to stay off its slopes. You can stay inside and enjoy some games of chance at Casino de Mont-Tremblant or see a movie at Cinéma Mont-Tremblant. If you want to get outdoors you can choose your own speed for activities. Helicopter tours offer the most relaxing opportunity, while a “snowshoe and fondue” walking tour gets the heart pumping just a little bit more (with a delicious reward to follow). If you’re really looking to get active, consider opportunities to go snowmobiling or even dog sledding at a mountain that caters to all its visitors equally. Various Mountains, New Hampshire: Check out Ski New Hampshire (Ski NH), the association that represents 30 some odd ski and snowboarding resorts in the state for great tips regarding non-ski opportunities as well. They can help you find a great off the slopes activity, whatever mountain you plan on visiting, including a snowy zipline adventure for a canopy tour of the forest your friends and family are zooming down. Let us help you save money with some great deals on ski destinations! Please note, all offers are current as of the date of this publication but some do expire. See applicable website for terms, conditions and restrictions. Save up to 30% with last minute travel deals from Expedia in Canada for your trip to Quebec! Snow saves you money on car rentals with Hertz! Save $50 on your weekly car rental this winter. Include PC# 210114 in your next rental to get great savings on your Economy to Full-size vehicle. Offer is valid for vehicle pickup from December 1, 2014 through January 31, 2015. Priceline offers great ski destination savings on everything from rooms to airfare and even cars. In general, look for ski towns that offer great opportunities in the areas of shopping and dining. More developed ski areas will have more to offer and things like spas and off-mountain entertainment will be standard fare. Consider the nature hike option, snowshoeing, cross country and other ways to appreciate a beautiful mountain locale, without having to zoom down it! Heading West? Check out our corresponding article on Ski Trips for Non-Skiers in the Western United States! Interested in booking or planning a vacation to one of these great ski locations right now? Check out some of the offers currently available for airfare and hotels at Kayak, Orbitz and Priceline. See more lodging options at Hotels.com and Hilton. Get started on your next trip today!